With only the three refurbished tanks, Miller and the 740th was asked to stop the 1st SS Panzer Division, the German spearhead in the Battle of the Bulge. Even before the Germans launched their surprise Ardennes offensive that December, Miller was not thinking about Christmas. His only thought was on keeping warm, he said. Northern Europe had been gripped by record-breaking cold. When the German tank columns first approached, Miller and his fellow Soldiers were in Neufchateau, Belgium, but they had no tanks. At the beginning of the battle, the 740th was ordered to proceed to an ordnance depot in nearby Sprimont. Miller was hopeful, as he believed tanks would be issued at the depot. However, upon arrival, there were no functional tanks. Depot personnel had left town in a hurry, leaving all of their equipment and tools behind. Miller and the 740th worked throughout the night and by morning, three tanks and a tank destroyer rolled out the gate. They were ordered to Stoumont to stop the German advance. Battle of the Bulge tanks and infantrymen of the Company G, 740th Tank Battalion, 504th Regiment, 82nd Airborne Division, push through the snow toward their objective near Herresbach, Belgium, Jan. 28, 1945. The 740th’s three tanks faced the lead element of Battle Group Peiper and the 1st SS Panzer Division. One M-1 Sherman tank fired and destroyed a German Panther. A second Sherman destroyed a second German tank. A third tank, a restored M-36, destroyed a third German tank. With the three German tanks out of action, and the narrow road blocked, the attacking German column retreated. Thus, a few restored tanks within their first one-half hour of combat had turned the tide of the German attack. Miller was part of a specialized unit. A few days later he crewed one of six Sherman tanks that formed the Assault Gun Platoon. His tank had a 105mm gun. During much of the Battle of the Bulge his unit supported the 82nd Airborne Division. Miller remembers the snowfall was especially heavy. Members of 82nd were cold and exhausted. Marching through four feet of snow was laborious. 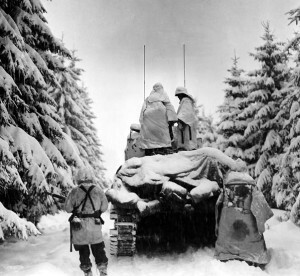 A few lucky Soldiers from the 82nd jumped on his tank to hitch a ride to avoid walking in the deep snow. Suddenly the tank took on enemy fire. When they heard audible dings from enemy bullets hitting the tank, the 82nd Soldiers scrambled off to take defensive positions. 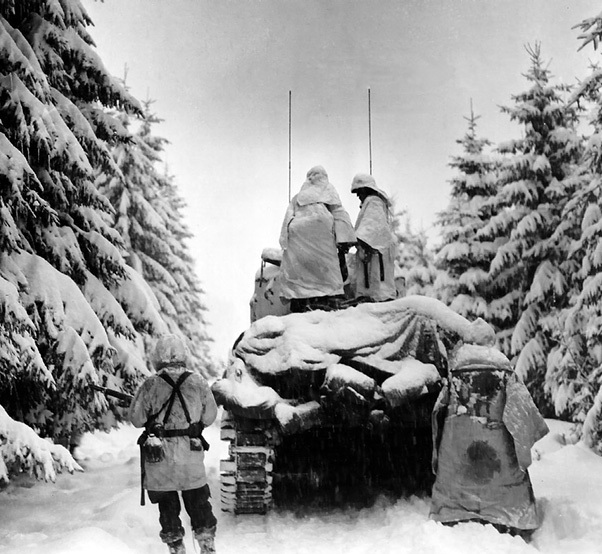 The Battle of the Bulge lasted from Dec. 16, 1944 to Jan. 25, 1945. It was the last major German offensive campaign on the Western Front during World War II. For the Americans, out of 610,000 troops involved in the battle, 89,000 were casualties. It was the largest and bloodiest battle fought by U.S. troops in World War II. 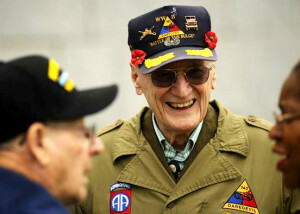 Harry Miller (right) and Harold Bradley, both World War II veterans, reminisce at the National World War II Memorial in Washington, D.C., April 30, 2016. Bradley and Miller served in the same unit for the Army at the Battle of the Bulge. The Honor Flight Network is a nonprofit organization that provides America’s veterans a free trip to the nation’s capital to visit memorials. The 740th Tank Battalion was formed at Fort Knox, Kentucky, on March 1, 1943. It had mostly men from Texas and Oklahoma. They trained at Knox and at the Desert Training Center in Bouse, Ariz.
Miller is a veteran of 22 years in the Army and Air Force. The Columbus, Ohio-native had always wanted to serve in the Army and enlisted at the age of 15 in 1944. Besides being a veteran of World War ll, he served in the Korean War with Gen. Douglas MacArthur’s headquarters, in the communications center. Miller later served in the Air Force during the Vietnam War with the Strategic Air Command. 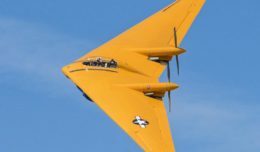 He was in charge of codes and cryptology used for command missions, including bombing runs in Vietnam. He retired from the Air Force in January 1966 as a senior master sergeant and a communications operations superintendent. Upon retirement, Miler worked as a private investigator, director of security and safety at St. Vincent Hospital in Santa Fe, N.M., and as a safety inspector at the University of Texas in Arlington, Texas, where he again retired in January 1989. He took up jazz and swing drumming lessons at age 69 to play with Seattle, Wash., bands. Miller, 89, resides at the Armed Forces Retirement Home in Washington, D.C. He laments that out of 800 Soldiers from the 740th, only six were able to attend this year’s reunion on Labor Day. Miller said he is proud of all of his military service and wishes he could do it all over again. He advises Soldiers who are serving today to stay in and retire.